This morning, NASA’s Cassini spacecraft obtained the first closeup images of Saturn’s innermost moon, Pan. The images show a peculiar body shaped like a “flying saucer”. Pan occupies a unique position in the rings, at the center of the 300-km wide Encke Gap. As best we can tell, Pan probably started its life as a more spherical moon, but it subsequently swept up a thick equatorial belt of ring-dust. A smattering of crevasses and craters across the surface add to our view of a moon that has endured a long and dynamic history. Yesterday, Pan was just a “tiny ring-moon”; today, it has been revealed as a world in its own right. Seeing these images has brought back vivid memories of the day way back in June, 1990 when I became the first person to see Pan. That story is worth retelling, because Pan’s discovery story has almost as many twists and turns as Pan’s battered and bruised geology. For example, most planetary bodies have just a single discovery paper; Pan has three. The story starts when the twin Voyager spacecraft flew by Saturn in 1980 and 1981. My colleague and mentor Jeff Cuzzi, of NASA’s Ames Research Center, was a member of the Imaging Team at the time, studying some of the newly revealed properties of the ring system. In those days, “image analysis” most often meant staring at photographic prints. Jeff had a stack of prints with him one day while waiting at the Albuquerque airport. By bending one particular print and looking along it lengthwise, he noticed something very strange–the Encke Gap had a wavy edge. A sideways look at a Voyager image of the Encke Gap. By taking a print and sighting along the gap as shown, the wavy pattern at the inner (right) edge becomes visible. Jeff realized that a small moon must be orbiting within this gap. As each particle at the gap edge passes the moon, it receives a gravitational tug that sets up this pattern. Once Jeff got home, he and his colleague Jeff Scargle set about examining all the other Voyager images of the Encke Gap. By assembling all of that data, they pinned down the moon–for now, let’s just call it “TBD”–into a 30-degree sector of longitude where no high-resolution images were available. They published their work in 1985 under the title, Wavy Edges Suggest Moonlet in Encke’s Gap. This is “discovery” paper #1. Meanwhile, scientists were examining other ring data from the Voyager flyby. 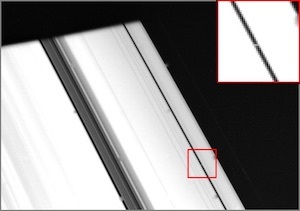 Two instruments had obtained “occultation profiles”–measurements of ring opacity at fine resolution across the rings. Both of the occultations showed periodic bright-dark variations near the Encke Gap, but at different locations and with different wavelengths. Jeff and I realized that these were slices through spiral patterns, which could be understood as another aspect of TBD’s influence on the ring. We called the phenomenon a “moonlet wake”. These patterns provided enough information that we were then able to pin down the precise orbit of still-unseen TBD. We published that paper in 1986, Satellite “wakes” and the orbit of the Encke Gap moonlet. “Discovery” paper #2. This brings us to June 1990, and one fundamental change. The Voyager images were finally available on that brand new, high-capacity storage medium, the CD-ROM. One morning it dawned on me that I had everything I needed to perform a truly comprehensive search for TBD. 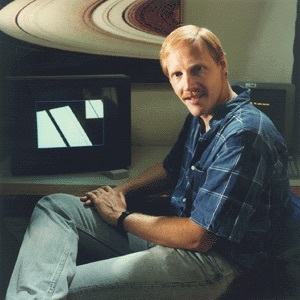 I had all 30,000 Voyager images of Saturn at my fingertips. I knew when they were taken and where they were pointed. Also, from paper #2, I knew exactly where TBD ought to be along its orbital path at each image time. I left for work that morning telling my husband that my plans for the day were to discover a moon of Saturn. 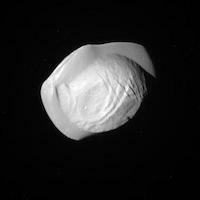 The discovery image of Pan. It occupies just a single bright pixel in the middle of the dark gap. By early afternoon my program had printed out a table of every Voyager image that ought to contain TBD, along with where in the image to look. Scrolling down that list, I quickly identified the most promising image, loaded up the CDROM, and checked out the predicted location. Just there, I saw a single bright pixel in the middle of the Encke Gap! A single pixel could be a glitch, but I quickly examined the half-dozen next-best images, and they all showed a bright pixel at the predicted location. Nailed it! “Eureka” moments don’t come along very often in a research career. That was mine. Shortly thereafter, I published Visual Detection of 1981S13, Saturn’s Eighteenth Satellite, and its Role in the Encke Gap, discovery paper #3. However, in astronomy as in life, it’s seeing the thing that makes it real. The Author, a very long time ago. Two postscripts. First I am often asked how I chose the name. It was a no-brainer. The name of the process whereby a moon can open up a gap in rings is known as “shepherding.” Moons of Saturn are named after Greek gods. The god of shepherds in Greek mythology was that flute-playing satyr, Pan. Happily, the International Astronomical Union liked my reasoning and approved the name. Conveniently, the name is also short enough to fit on my license plate. Second postscript. I proudly submitted my manuscript to the journal Nature. It was nearly rejected, however because the reviewer said, “we already knew the moon was there, so seeing it for the first time is no big deal.” Luckily for me, the editor was of the “seeing is believing” school of thought, and Nature published the paper anyway.